Dr. Weisman:	Hey! 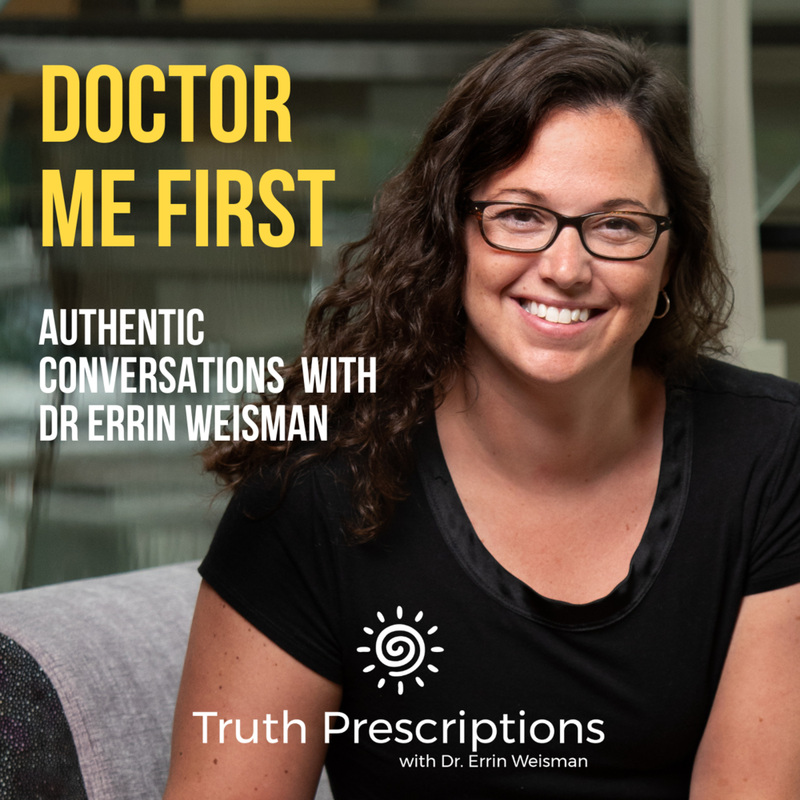 You are listening to Doctor Me First with me, Errin Weisman, D.O. This is episode number five. This podcast is where female physicians come to have authentic conversations, get encouragement, and get refreshed to take on the world. Dr. Weisman:	Feeling alone in medicine? Well, not anymore because you are in the right place now. I'm your colleague in medicine and coach in life, Dr. Errin Weisman, and I am all about support, encouragement, and hope. Dr. Weisman:	So in each episode, I sit down and talk with an amazing female colleague and her one homework assignment is to pick a work for which our conversation rolls around. Dr. Weisman:	Today's episode, I am talking with Dr. Dana Corriel and her word that she chose is SoMeDocs. We'll get into the conversation, if you don't know much about SoMeDocs, and she'll explain a little bit more to it. But I find it absolutely fascinating and cannot wait to share this with you. Dr. Weisman:	And hey, stick around afterwards for a kick of encouragement before you head off to your shift or day. Dr. Weisman:	Hey everybody, it's Dr. Errin Weisman. I have another special guest today. We have some interesting topics to talk about and we are just going to go ahead and roll with it. Dr. Weisman:	So, Dr. Dana, go ahead and tell us about yourself. Dr. Corriel:	So, I'm a board certified internist and I work at Pearl River Internal Medicine in an outpatient practice. I'm also the director of quality for ... Oh, I'm sorry ... for my practice. I am the creator of a more innovative type of forum called SoMeDocs. It's a Facebook group that is physician only at this point on Facebook and it unites a lot of us that see the potential of using social media in medicine. Dr. Weisman:	It's not just how you write it, but it's so impactful because I find that it really speaks to my soul at times because you are speaking directly from the perspective as physician and we don't always see that on the internet. So, tell me what kind of inspired you to start the hashtag SoMeDocs? Dr. Corriel:	So, my own journey started it. And so you sort of mentioned how it speaks to your soul, that's exactly why I started my own journey in social media so many years ago is that I was making ... I was impacting my patients on such a positive level behind closed doors and it was just a one on one. And at some point I started realizing that I have the power to impact more, but I wasn't able to do it in a regular physician practice. Dr. Corriel:	Then my time away from medicine sort of acquainted me with the potential benefits of social media and what could be created using social media. And so I sort of meshed the two together. I said, here's this amazing platform that has so much utility and use in medicine and it's not being used in medicine. Now that I'm back into medicine and practicing as a physician, why don't I find a way to mesh those two together? And that's what I did. Dr. Corriel:	I opened up my own page and it was slow to take off because we're still ... There's a lot of issues [inaudible 00:03:42] on social media and I was not excluded in feeling those issues. I mean, I felt like I was bearing my soul to the world. We have this tradition of hiding ourselves in our lives and there's no reason because we're humans. And so, originally my subtitle, my tag was the medical doctor next door because I felt like I was just like every other person. When I wasn't working as a physician I felt a big part of the community and I felt sort of more connected to those people in the community. And now that I'm back at work as a physician it sometimes separates you from the rest of your community. And so I wanted to mesh together those two. Dr. Weisman:	Yeah. Almost like normalize it, like "Hey! We're a mom, we're not a god, we make mistakes." Dr. Weisman:	Our dogs puke on the floor too. Dr. Corriel:	Exactly. And it's funny because one of my ... I have like 250 drafts right now for all my blog books because I have so many ideas of what to write about, but one of them is titled 'We Are Not Gods'. I haven't yet gone into it, but just the title, itself, is sitting there in the draft. Not because I think that I am a god, but because sometimes, or at least in the history of medicine, we're sort of referred to in that way. And we're not! We're humans, right? Dr. Corriel:	Humans make mistakes and humans have emotions. We get emotional in our visits. Sometimes a patient will tell me a story that is so heart wrenching because the nature of being in medicine and being their primary care doctor, but I start to cry. I start to tear because I'm human. Dr. Corriel:	I think the patients appreciate it, by the way. Dr. Weisman:	- vulnerable and authentic. Dr. Corriel:	I love that. Dr. Weisman:	For us, as medically trained physicians who have oodles amount of knowledge and so much passion for what we do, we have done a disservice to our practice by being stoic. Dr. Corriel:	Bingo! This is literally what I'm about, is just let's come out from behind the veil and let's show ourselves. It's okay to show that we are human. It's okay to connect with patients outside of the office and on a level of ... Again, social media, legally covering ourselves, we still have to protect our patients. HIPAA absolutely applies. We need to do it intelligently, but we need to do it. Dr. Corriel:	The bottom line is that we need to be tomorrow's influencers. We're not because we haven't been on social media and so who's the influencers now, right? Dr. Corriel:	Kim Kardashian. You know and not for bad reasons. I mean, she's extremely clever with what's she's done, but you know what? She is a wonderful person to look at, at what's she's wearing. I don't know that I'd necessarily listen to her medical advice. And this is where our society has kind of gone down hill, has been well, you know you see vaccine misinformation out there and you see misinformation about so many things. Jade eggs from Gwyneth Paltrow. Things that are just not medically backed and everyone's doing it! Dr. Corriel:	And you know, I have to sort of backtrack with my patients and like real them in and say, "Wait a second. Who told you that? Did you read that?" And I see the gears spinning in my patient's head where they're suddenly realizing like, "Oh my gawd, I read it on social media and like my neighbor wrote it." Dr. Corriel:	Well, I think CBD ... Right, and I think CBD oil has some benefits. Dr. Corriel:	And again this is where I always say, it's like evidence based medicine is what's important in medicine and this is what we should be focusing on. So like if there's a study that says CBD oil does X, Y, and Z, then it's okay to talk about that in that regard. And it's also ... You know what? It's also okay to put opinions out there. But everybody needs to understand who it is that is writing, what their credentials are, and what is opinion versus what is a fact. Dr. Corriel:	Different things. And so when we, when physicians are referring to pseudoscience, we're not trying to put you down, we're just trying to say that it may not be factual information. Dr. Weisman:	So, I guess I just, you know, speaking to our audience, we feel your frustrations just like you're feeling those frustrations and I think that's where it's been great having SoMeDocs because then we kind of get together and we have each other's backs. Dr. Weisman:	For instance, the anti-vaccs people. Now we're in flu season. You know? And, I mean, I support my physicians who put out about flu vaccines. Dr. Weisman:	And I think it's a great forum where you can gain support. Because I think that's one of those things when you first start venturing out and putting yourself into the world. It's a very lonely place. Dr. Corriel:	Oh my gawd, very lonely. And so that's where SoMeDocs was created by me. It was because of two things actually. It was because I was being told no a lot in different ways. Like I ... There are other existing platforms out there and some of them are fabulous, others are very restrictive. I was feeling like I was being told no. And that's okay, I am a rule follower and so I wanted to respect those other platform's rules, but at the same time I said to myself, "Wait a second. I've got all this talent, and I've got all this potential, and I've got all this writing that I want to share with the world. What about a platform that says yes. What about a platform that allows us to all sort of shine and share and not feel stifled by anything?" Dr. Weisman:	- it's a great place to get started. Dr. Corriel:	Well it's not only that, but it's other ... All the platforms are being used for so many different reasons. So, like we are everywhere. So, you can find us on any platform using the hashtag SoMeDocs, where I try to also spend a lot of my day like re - Like sharing everyone's work and spreading our messages. But you can highlight whatever skill you have. Dr. Corriel:	So, let's say you take great photographs. You can use Instagram in the way that you can't being a physician. It was never meant to be for physicians, but you know what? It's a great way to either release some of the energy we have after work or it's a way to also show that we've vaccinated or it's a way to show like this and this illness can be ... This is how we should approach it. It's just a vehicle of communication really. Even if you're using pictures. You can communicate via pictures. I mean, let's not forget our children, young children look at picture books and they still get the message, right? And so it's the same with these social medial platforms. Dr. Corriel:	Instagram is pictures and Twitter is limitation in character, but just very quick sort of spout outs, right? We can get a lot of people's attention that way as well. Facebook is sort of a combination and Linkedin is for a more professional way of sharing things. So, that's where doctors have the power. Dr. Weisman:	I'm really loving our colleagues that are doing the YouTube videos. I think that is so awesome. Dr. Corriel:	Amazing. It is. Dr. Weisman:	It's so amazing. I've seen a lot of discussion in the group about that. Dr. Corriel:	Yeah. Dr. Weisman:	And I'm just like ... I just ... I'm so excited for them and that's where, again, I think it's just a great place to go and get encouragement. Dr. Weisman:	So, what would you tell the doctor who is listening to this and they're like, "Gosh, this sounds like a lot of fun. I kinda want to do this, but I'm fearful," what would you speak to her? Dr. Corriel:	A lot of physicians are fearful. So, number one is that we all get it and we are all there. We've all been there. We're even there now. I think even the things I do, I'm extremely scared and I push myself out of the box daily. So you're not alone, that's A. But B, that's the point of joining SoMeDocs is that you are not alone. You're joining the community of doctors that many of us are already embracing it, we're taking that dive. Dr. Corriel:	But there's many on there that are what we call lurkers, physicians that are just like watching us in action. They reach out to me all the time. A lot of times it's in private, it's to say you know, "I really like what you're doing, it's inspiring," and that's really important for me too because I take that positive feedback and I use it to fuel what I do. So, I do more when I hear the positivity. I appreciate the doctors that are not only benefiting, but are reaching out to me and telling me that. And also paying it forward. What I mean is that if they put out an article they're hashtagging SoMeDocs or they're linking the Twitter account to SoMeDocs and paying it forward so that we grow as a group. Dr. Corriel:	Then you're doing something good. Dr. Corriel:	I know, I agree. Dr. Weisman:	- that kind of emotion. Dr. Corriel:	Yeah. The fear of what others will think has been an issue for me, a big one as well. I think it's part personality and part just what we do. It's funny. I'm actually writing an article about it now, about having grown up a pleaser and the different reasons why I grew up a pleaser, I think. I'm dissecting that and why I've become a displeaser. I call it that because I literally look at ... It stems from my son asking me "do we need to please everybody?" Dr. Corriel:	And it was a really insightful and smart question that made me think. It made me think of my own pleasing versus displeasing, and all the years of me being on social media and being so scared to post things because of what others would thing. And then at some point ... I can't pretend like I'm fully 100% past it, but I can tell you I have thickened my own skin. I have become a lot more, a lot less ... I don't want to say I don't care about what others think, but I'm a believer in what I can achieve. You know what I mean? Dr. Corriel:	Like I've gone over the ... I've been able to step over that imposter syndrome in me. Like, what am I doing and why am I doing it? And see the greater good of what I'm doing. And so, that makes me not consider the people that are judging. And I think when you're judging others in general, there's something wrong with you. Dr. Weisman:	Mm-hmm (affirmative). Yeah, you've got to look internally and ask yourself why. Why is this bubbling up? What is this bringing up in me so that I'm projecting it? Because, like you said, once you get over that hurdle and you get that first post out or that blog. When you do it and then you almost, you gain traction because you realize, "Oh, it wasn't as big and bad as what I thought." Dr. Weisman:	You know, done is definitely better than perfect. You know, just get it done. Just put it out there. And you learn so many lessons, you meet so many great colleagues and friends, and exactly. That fear never goes way. I'll be perfectly honest. I feel like every time I post or any video I put up, there's always that like, you have to like .... It's like going into a big procedure. You know? Like getting ready to intubate somebody, for me, in the ER. I still have to take that breath, I feel that adrenaline and that nervousness, and you just go anyway. Dr. Corriel:	First of all, I think we all have it. You can say you don't have imposter syndrome. Everyone's got it in one way or another because it's a natural part of us in that we feel kind of, especially with successful career oriented individuals, you're constantly pushing forward and trying to succeed and you're comparing yourself to others. And so, when we learn to use imposter syndrome to our own benefit that's when we succeed in life. That's when we can be happier individuals. And so, it's an extremely ... Again, it was an extremely popular blog post that I think that the readers may like to read. Dr. Weisman:	Yeah. And I even go back, hearing you talk about that, I remember the first time in medical school. I think I was maybe a first year medical student, we did pelvic exams. Like on paid people who came in [inaudible 00:17:39] or whatever. Dr. Weisman:	And I had such a great attending ... Not that I like was freaking out, but you know as the group there was nervous energy. Dr. Weisman:	You could feel it. You know, it's the first time you're doing an intimate procedure on a total stranger who is totally letting you do this to their body. Dr. Weisman:	And I remember him saying to us, "Okay student doctors, you'll remember this moment for the rest of your life and I want you to take a breath in and be grateful for this experience." Dr. Corriel:	Wow, love it! Dr. Weisman:	He totally acknowledge that we were all kind of freaking out. Because, you know, in the back of my mind I was thinking, "Oh my gawd, how is somebody going to let me do this to them?" You know? Dr. Weisman:	Because exactly, it's a very intimate type thing. And he totally diffused it. Like you said, he flipped that imposter syndrome - Dr. Corriel:	Amazing. Dr. Weisman:	- and he's like, just be grateful. It's okay to have some fear. It's okay to be nervous. It's okay to remember this. Keep moving through it. And so, that's why I encourage people too with, you know, venturing out into something a little bit different, be it social media or maybe like a side gig or whatever that is. Dr. Weisman:	I'm a recovering perfectionist as well, just so you know. Dr. Corriel:	Yeah, for sure! Exactly! I mean, you don't have to be perfect. You just have to ... In another article I wrote, you just have to take that dive. You have to dive in. It's like testing the waters when we were little and we wanted to like see what the temperature is. No! You just take a dive. I mean, you've got to be ready for it. You've got to set up some of the like handles across social media, your handles, but then you take that dive. You don't have to be perfect. And from personal experience I could tell you that. Dr. Corriel:	I mean, I started out writing and my writing wasn't as good as it is now and my writing is not as good as it will be a year from now. I mean, we become better with practice. Because really, it's like a cliché, but it's true, practice makes perfect. It's just like medicine, right? Dr. Corriel:	You get to be a better physician as you practice. It's the same with social media presence of writing. Dr. Weisman:	Absolutely. How would you say that your creativity, how it's bloomed and blossomed through this process, how has it effected your practice in medicine? Dr. Corriel:	It's amazing. Creativity in medicine is something that is so underutilized. It's ... My own use of creativity outside of the office has allowed me, I think, to become more empathetic with my patients, to connect with them on a deeper level, and just to become more emotionally aware in general. As a primary care doctor, I think it's really crucial. Dr. Corriel:	You can also bring it into a practice. So, for example, you can use creativity to spread messages that are otherwise very boring. In primary care medicine, if I went out there and I just talked about blood pressure, it may not be super interesting for people to read, but if I take a twist on it, insert some fun words into it or an image that's captivating, then I can get patients to actually head what I'm saying or to pay attention and say, "Ooh, Dr. Corriel has some really cool stuff that she's staying." And so, mixing in creativity can make it not only rewarding for me, as the physician, but also for the patient, the readers. Dr. Weisman:	Absolutely, absolutely. Well, Dr. Corriel, I really appreciate this time together. I know that you are speaking to us on your lunch break, which I greatly appreciate. Dr. Weisman:	Tell our listeners, if they want to know more about you and find out more about you, where can they go? Dr. Corriel:	Right. So, I'm across social media platforms under the handle Dr. Corriel. That's D-R Corriel. D-R C-O-R-R-I-E-L. You can find me on Twitter, Facebook, Instagram, Linkedin. I also have a website, drcorriel.com. I'm working on some amazing new ideas, so if anybody has something that they'd like to reach out and speak to me about, I would be more than happy to entertain other ideas and everything so we can all make a project together. Dr. Weisman:	Awesome. Well, thank you so much for your time. You go cure some blood pressure. Dr. Weisman:	And we will talk again soon. Thank you so much. Dr. Corriel:	Thanks. Any time. Dr. Weisman:	Wasn't that such a great conversation with Dr. Corriel? It just gets me all fired up to continue working on things online, to keep putting my voice out there, and I hope that it encourages you too. I think she really did hit on something when she was talking about the imposter syndrome and, you know, like the fear of being discovered. I've definitely come across fear, just even during this podcast, putting myself out there. Dr. Weisman:	I was re-listening to some previous episodes and how just horrible the sound quality was or that I say um a lot. And I wanted to nitpick it apart, but really it's not about that. It's about the content, it's about what we are trying to say in the world, and it's honestly about the intent of your heart. Dr. Weisman:	So, I ask you. What project or what idea is brewing in your brain? Something that really excites you, that really gets your creative juices moving, but you are paralyzed in fear to move on that? I would love for you to message it to me and maybe potentially we can help each other through that. Dr. Weisman:	I know that I have had some great colleagues who have helped encourage me when I'm like "Ugh, I don't know if I should post this." I let them read through it, they tell me how much of a rockstar I am, and I get that encouragement. And most of the time it is absolutely awesome. Dr. Weisman:	So just think on that. What creative project do you need to be doing? Maybe it's something on social media. Maybe it's something in life. Maybe it's something out into your community. Maybe it's something within your home or your faith community that you've been thinking about. Whatever that is, I would encourage you to just entertain the thought and say what if. What if I really did this, and start working a little bit on it. Dr. Weisman:	And then take that next step of actually putting it out into the world and seeing it fly out into the distance and spread to all those that you love and care about. Dr. Weisman:	Well, I thank you again so much for joining me today on Doctor Me First. I hope that it really truly does doctor your spirit first. Again, I would love to hear with you and hang out with you in any ways possible. Come check out the Doctor Me First Facebook group. You could hang out with me on social media under Truth Prescriptions with Dr. Errin Weisman. And don't forget about that VIP group that's forming right now that will start in February. It's a collection of female physician colleagues coming together to work through current issues that we're having, either in practice or in life, that could be potentially leading to burnout. And it's for those who want to go from just surviving life to thriving in life. So check that out as well. Dr. Weisman:	And, hey, always asking you for this favor, but entertain it for me. Would you please share this podcast with any other female colleagues in your life right now? Because it really, truly is my goal to get this out to as many female physicians as possible. Because really four years ago I needed this. I needed to know that there were other female physicians out there and that I wasn't alone in medicine. I needed to know that burnout was not my own personal failing. I needed to know that true and authentic help was available and that change really could happen to my life. So help me spread the word to those that you know. Dr. Weisman:	Also, if you're interested in being a guest, I would love for you to click in the link below and schedule a time with me. Again, this is open to any female physicians. All you've got to do is have M.D. or D.O. behind your name and come up with one word for which we'll talk about. And also, if you ever just want to talk one on one, privately, I am always open to talking to any colleagues. Dr. Weisman:	Want to know more about what I'm doing? Well, head over to my website, truth prescriptions, that's truthrxs.com, and you can find out all of my craziness that's going on there. Or hang out with me on Facebook, Instagram or Linkedin. I like to hang out in those three places. Or if you want to get on the phone or have a video call, girl you schedule directly with me. Let's get on the phone, let's have a colleague to colleague call, and let's see how we can take your life from just surviving to absolutely thriving. Dr. Weisman:	As always, remember your life, your calling, your pulse matters, and I'm here for ya. I got your back.